As mentioned I have closed my domain website so unable to offer downloads as previously unless I get a new site. 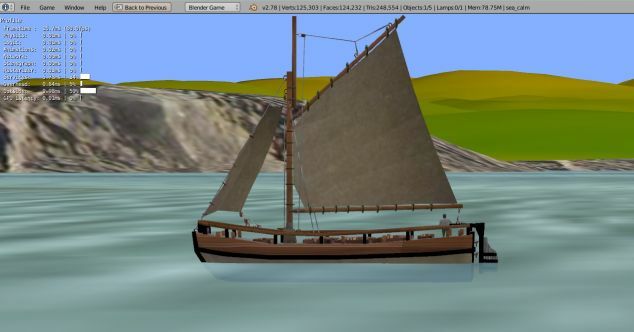 However remakling routes and sailing ships but with the possible changes to the Blender Game Engine things are a bit uncertain. Anyway remade 20 basic coastal routes at 25km sq approx. following around the coast starting from the Solway Firth. The example shown is a part of the Whitehaven routes. Maritime simulations (basic) can never be finished as always something to add or alter. Should anybody want any further details or queries just post. If not no matter. Sailing flats are barge with sail and were used in some rivers and estuaries. Era is maybe over a century ago. Size doesn’t seem to affect the frame routes much as still at 60 fps on 7 year old computer and nividia card. What is the main focus or aim in Maritime in BGE? And why is it so important as a Game? Pls explain to me i dont understand anything abt maritime! Simulations for ships such as Virtual Sailor and shipsim. You can download demos, especially shipsim as includes some main harbours. Several trains simulations with trains. I used to make content and routes for Trainz. A member of Trainz forum has put the sailling barge shown into Trainz, runs on invisible track. People make them. I make ships and ship routes. That’s about it I think. Download a few demos if interested, or can give you the links to them. Thought of another example. I havn’t looked at what you are making ‘speed racer’ but say it was motorbike or car racing around real mountain scenery. Simulation would be driving a car say through narrow lanes or dirt tracks of real life terrain. For a game it would be racing cars around the mountainside or scrambling with a motorbike or bike over rough real life terrain. Same with ships and boats I am interested in the age of sail of past ages, or if modern you could have speedboat racing down rivers and along a real coastline. 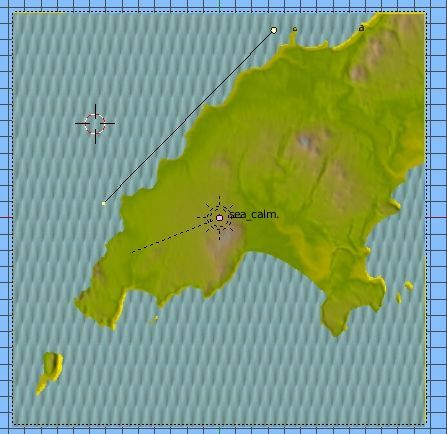 With ship sim one scenario is rescuing a person floating in sea. I have used that idea myself in previous routes I made with person floating and barrels drifting round. 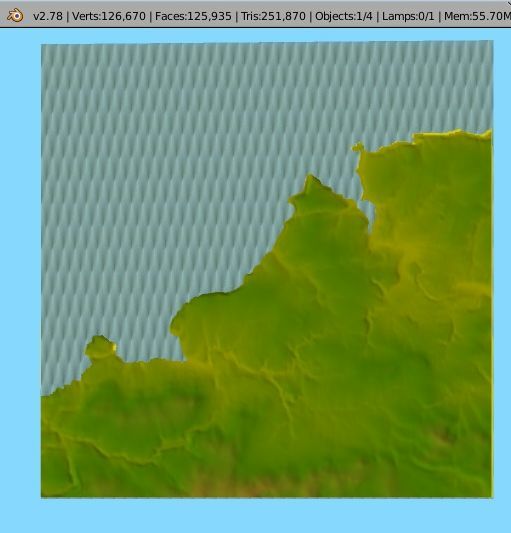 Terrain can be made easily with script and satellite data. The rest you just make whatever interests you. So not one game or simulation but numerous alternative games or simulations. To make the terrain say half an hour to an hour. Also in reply to the query maybe the focus of aim is the circumnavigation of the UK. So far 20 x 25km basic routes made so wil start expanding these. Also another aim is the coastal interest in the past ages and bygone time for myself…and others should there be any interest. Era will probably be about early 1800s this time as remaking the 3 miles aprox. of Liverpool docks at that time, so sail and paddle steamers maybe. Will probably take a while to remake the quays then slot it into the 25km Liverpool and Mersey route by reshaping the terrain. I think that will do for now as that is the outline of what I make. This is very interesting i like what your making @barrymaritime well originally “Speed Racer” was meant to be a simulator on the BGE but i said it will have to take everything seriously and so i decided to go for an Arcade Racing theme just for players to have fun and so i had to rework all the physics to make it Arcady. But its not bad ey my only issue was going to be, getting actual real world places in the game. since i’d have to model everything from scratch. Are you using any satelite data for your map’s? Fred - I use satellite data for all the routes as no realism otherwise. I don’t want to add unecessary details to the post but if interested I can explain the method I use and essential to use the script. Best to enable that now incase not available in future BGE. I am using 2.78c I think it is and script also in 2.79 (I think). First step is as follows (If you want full details of how to use it and srtm2 links and how to use them , etc. just post. Then click the the empty box opposite. Don’t forget to click when finished ‘save user settings’. Thks @barry i wish you all the best with your project anf and also thks for showing me. Use osm Open Street map. Click export and manually select. Do not download but copy the co-ordinates which you enter into the script. The final job is to download the srtm2 sections and it’s the link is at bottom of page SRTM2 released. These must be in the same folder when you save the script to it. Once you get used to it only takes say 10 to 20 minutes. Post if you need further details. Liverpool docks of early 1800s now in the river Mersey route. ssems to b an invalid link so see if it deleted? I wish I knew what the future of the BGE is to be for certain, then I would have more incentive to carry on making these routes following around the UK and perhaps start making them available for others, again, with a new website. Seems to be a no-mans land at the moment as regards future bandwidh requirements and definitive decisions. Even a basic route of terrain, sea and one drivable ship, and roaming camera. Would they even still work for others, as would depend on what version of Blender they have. I try to fireproof them a a bit and not use ngons and with criss-cross trees make the back to back and flip one side rather than double sided texture, etc. What would be the maximum size as 25km works well at present even with docks and a few AI ships. Again would the srtm script still work…as essential …and so on. 125,000 vertices seems to be no problem and easy to reduce it considerable by replacing seabed with single flat sheet same as the water sheet at 25km square at 4 vertices. Easy enough to add grass and rock photo textures etc. The other alternative is just make as many basic routes as I can…for myself… and work on them in the future…but seems a waste then. As described above added a few rocky areas and grass. As these forums are apparently limited to small games, artwork and small films etc,etc which unfortunately I was not aware of originally,…having posted on commercilal train and ship forums for several years making both routes and content for them. Any ‘abrasive’ ’ comments will be totally ignored !! I thnk best for me to finish further posts for the presenr time and see if Blender develops a serious side for real life simulations and in my case maritime as a good part is sea and seabed which can easily be replaced with a 4 vertices flat seabed that will save 1000s of vertices. Routes up to about 25km can easily made in about half an hour for the terrain and sea. 3DEM for basic colours. An example of 25km route is shown bekow with Bardsey Island at the tip. Takes maybe half an hour to make. Sea can be animated to rise and fall as tidal or about a meter to sImulate wave swell. Copy and paste the roaming camera takes one minute. Copy and paste textures semi-transparent sea sheet at 25 km at one minute. copy and place sail ship on minute. basic 3DEM height colouring BEFORE photograpic textures of rock, grass, etc. So I will see what develops…if anything !..and as above any ‘abrasive’ comments will be totally ignored!!. A bit puzzled why there isn’t a section for ‘serious’ simulations’. Not too serious, but a program such as Blender has many ways in which it can be used. I only know of the Blender Artists Forum and it could easily have a section for ‘simulations’ in which you can also have ‘games’ by creating scenarios within the simulation. You have the whole world to model for any era and so far I find that 25 km size routes run quite well on a 7 year old computer and nivida graphics card. I have made up to 45 km size using satellite data but not suitable at this size for lower end graphics cards. Surely there should be some recognition of simulations. These do not need to be just maritime like mine but possibly aviation and road transport would be possible. There are seveal train simulators but I don;t think these are suitable for Blender. Anway back to real life…simulations are based on real life details and especially .hgt satellite data. Follolwing along the coastline up to Cardigan Bay starting from the Solway Firth…might go as far as the Thames…again. and in the Blender game engine miles of coastline to texture or create content relating to any era. Photographic terrain textures to be added, then you add and create whatever you want to place into the routes, AI movement, drivable, or make scenarios within the routes. I think that just about summarise the details. A bit puzzled why there isn’t a section for ‘serious’ simulations’. Not too serious, but a program such as Blender has many ways in which it can be used. I only know of the Blender Artists Forum and it could easily have a section for ‘simulations’ in which you can also have ‘games’ by creating scenarios within the simulation. The ‘Game Engine / Finished Games’ forum is the appropriate place as it is for ‘Completed projects using the Blender Game Engine’. Whether the completed project is a game, simulation, virtual real/imaginary world or some other interactive scene makes no difference. To simplify my reply the routes are ongoing and simulations are never finished as there will always be things to add, alter or remove. So on the terms of the moderaor I will post on the completed forum 25 routes made and might make about 100 to end the Thames Estuary starting from the Solway Firth . At present as I removed my domain site no further downloads available but I ‘if enough interest’ I might reconsider purchasing a new domain site. I have my doubts about the future drirection of Blender as regards real life simulations but as these routes are ‘ongoing’ I will start them as version 01. Further details will be on the completed routes forum as reqested as it is not my forum.